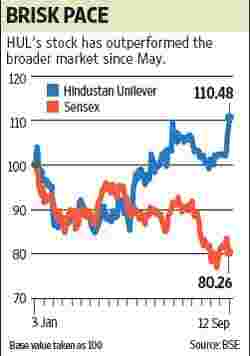 The spike in Hindustan Unilever Ltd’s (HUL) stock should be seen in the backdrop of weakening industrial growth. At such times, consumer firms selling goods such as soaps, detergents, shampoos and even packaged foods, are less affected. Hence, their shares make for safer havens than say those of the so-called industrials. Industrial growth numbers released on Monday disappointed investors. But the consumer non-durable sector (packaged consumer goods) did better, rising by 4.1% year-on-year (y-o-y) in July compared with 2.3% growth in the manufacturing sector. That adds some credence to the sector’s relative strength. HUL’s share price rose by a sharp 3.8% on Monday compared with the broader market’s 2.2% decline. HUL’s volume growth has come back to relatively healthier levels. In the June quarter, sales rose by 14.8% y-o-y, with volumes growing by 8.3%. But margins have been under pressure and, but for restrained advertising and promotional spends, would have fallen in the June quarter. Rising input costs are the main worry, which have not been fully passed on to consumers. Of late, price hikes are becoming more noticeable, while promotions have been scaled down. But the price hikes have been gradual in comparison with the rise in input costs and in some products, are a rollback of massive cuts in prices to ward off competition. True pricing power is when price hikes exceed inflation, which is not visible yet. Higher product prices will also test the resilience of consumer demand in an environment where inflation is rising as well, and economic growth is in the danger of slowing. So, companies are likely to be very careful with price hikes. They have to be mindful of competition as well. Multinational companies are unrelenting in their desire to continue growing in emerging markets. For a market leader such as HUL, this could mean higher advertising and promotion spends, moderate price hikes, and a focus on volume and market share growth, than on profitability. Investors hitching a ride on the HUL flight should watch out for turbulence ahead. If sales growth remains healthy and profitability is stable, they should do fine, but if either wobbles, their calculations could go awry.